Through correspondence with TV personality Fred Rogers, one survivor of cancer found hope and inspiration. FRED ROGERS BEGAN HIS long-running national television show, “Mister Rogers’ Neighborhood,” in 1968. I was 18 and missed growing up with him, but as a young professional magician working with kids, I was greatly inspired by his work. Twenty-five years later, I was negotiating with KOIN-TV, a CBS affiliate in Portland, Oregon, to create and produce my own national children’s television show, and my groundwork included contacting other children’s performers to be certain that we were properly addressing our audience. I sent off a letter to Fred and soon received a thoughtful and inspiring reply, the first of many. I didn’t have breast cancer then, and he had not yet been diagnosed with stomach cancer, but our conversations left me with a hope and inspiration that would shape my future and add remarkable depth and clarity to my cancer experience. Our show was about natural history and the magic of nature, and the persona I created was Dr. Wilderness. I wanted to give him a sincere and genuine presence that would inspire kids to believe in the magic of the natural world and believe in themselves, too. I wanted him to be like Mister Rogers. A Presbyterian minister, Fred never felt he had given up his ministry to do his television show. “I consider that what I do through Mister Rogers’ Neighborhood is my ministry ... the more I think about it, the more I wonder if God and Neighbor are somehow One,” he wrote in a book he published. Fred was an amazingly aware and generous man who knew a lot about kids. He knew a lot about grown-ups, too. And the advice that he so kindly offered to me through his more than half a dozen letters over the next year was a gift that has added meaning and purpose to my time here on this amazing planet Earth. When cancer first appeared in my life, it began not with me but with my wife. She had been suffering from fatigue, bloating and indigestion, and we found a doctor who diagnosed her with giardia, an intestinal parasite we had both picked up on a trip to Nepal. But another six months elapsed with no improvement, and, after a series of tests, an internal medicine physician gave us the news: stage 4 ovarian cancer. It was extraordinarily difficult for me to balance the excitement of creating my show and the distress of dealing with my wife’s advancing cancer, with chemotherapy, surgeries and clinical trials. I vowed to be her caregiver, and together, we faced the rigors of trying to survive her life-threatening disease. Meanwhile, television executives decided to make my pilot program a primetime family special that would air on CBS stations around the country on Jan. 26, 1994. This was exciting, and I realized that my commitment to create the show with complete respect for the families who would be watching was more important than ever. Fred had a talent for expressing sincerity. He spoke openly to his audience of young children, looking directly into the camera as though he was speaking only to them. I adopted his style by inviting kids into our show in the very first scene, just after the opening song, as I gently floated down from the roof of my cabin. I turned and looked into the camera’s lens, imagining a million children looking back and singling out just one. It was Mister Rogers all the way. The night my show premiered, my wife and I watched it from her hospital room. She was also ill and in bed the night I traveled to Seattle to accept the show’s two Emmy Awards. They were a wonderful gift, but the glitter on those statuettes was greatly dimmed by our circumstances. I never blamed cancer for that. And I vowed to remain strong as my wife’s condition worsened and her prospects for surviving grew dim. The idea of joint ventures with folks who wanted to help us be better made perfect sense, both in work and in life, so my wife and I looked around for help. We found it everywhere. At the time, we lived in rural Oregon, in the woods and in a cabin, but I reached out to the various cancer organizations in Portland. The response was immediate, compassionate and utterly overwhelming. As my wife’s hospital bills reached half a million dollars, the state, with its newly implemented Oregon Health Plan, came to our assistance, along with some remarkable and loving help from the community we lived in. We were loaned a small, comfortable trailer to stay in while my wife was in treatment at St. Vincent Medical Center in Portland, an hour’s drive from our home. The hospital invited us to park it on the grounds. Some of Portland’s best hotels donated nights to give us breaks from the trailer. We were deeply touched and humbled by so much generosity. My wife wanted to give something back, so we began to travel to kids’ “cancer camps” in Oregon and Washington to donate our magic shows. One day a neighbor asked us where we would go if we could choose any place in the world. My wife answered, “The rain forests in the Amazon jungle!” Two weeks later we were on a plane to Ecuador with a transfer to a glorious lodge and research center in the middle of the Amazon — all expenses paid. Friends and family were concerned that we had chosen such a remote location to visit with her “disability.” We never gave it a second thought. For us, it was the chance of a lifetime. And we both knew intuitively that a lifetime was drawing to a close. We did not suffer from any of those disabilities on that final adventure. Not long afterward, Meg Chrysler- Barnes died on the afternoon of Feb. 14, 1997. It was Valentine’s Day. She was 47 years old. My breast cancer was diagnosed in May 2014. As so often happens, I had no symptoms other than a tiny lump in my left breast. It never occurred to me that men could get breast cancer, but each faces a 1-in-1,000 chance. I was lucky to catch it early. My mastectomy was performed within three weeks of my diagnosis, and I was found to have stage 1, grade 3 breast cancer. Fred and I never exchanged letters after my wife died. 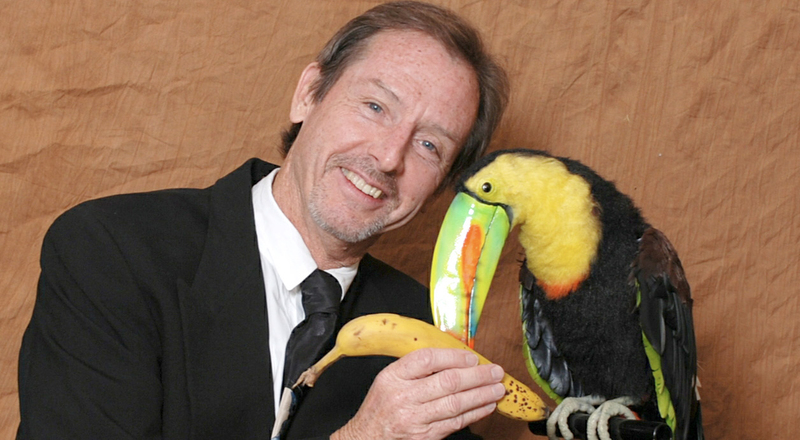 I continued to work as a magician, performing stage shows for the next 20 years, often as Dr. Wilderness. My television show aired on Earth Day the following year, but the station never sold it as a series. Fred died of stomach cancer on February 27, 2003. I am 68 years old as I write this. I rarely get onstage to perform magic anymore. Writing and talking about cancer has become my life’s work — my ministry, as Fred would say — and this is rewarding on so many levels. I’m proud to have called Mister Rogers a friend, even though we never met face to face, and I’m proud to have an opportunity to be of service to the cancer community. After all, there are a lot of us who can use a good and kind and honest assist now and then.